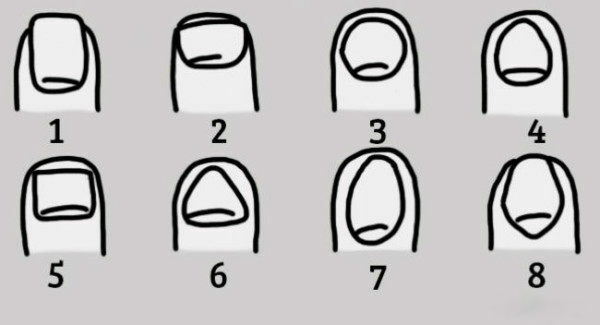 Did you know that the shape of your nails can tell a lot about your character? It’s simple just look at your nails to spot their shape and compare them to the image. If you are not able to find your type, just pick the one which mostly resembles yours..
1.Long nails with rectangular shape – People with this type of nails are very social and communicative. They have sharp mind finding satisfaction in new friends and looking forward to some new experiences. The motto connected to these people’s jobs is ‘Measure it three times, cut it once’. The issues are being studied from all perspectives and the optimal solution is always chosen thinking to the smallest details. 2.Wide flat nails – These are people who have a clear mind, analyzing everything and everyone. They always turn for advice, listen all the opinions and think before they speak. Moreover, they understand people’s characters well and always want to make something new going with the thought that everything will pay off later for sure. These people are interested in utility and convenience due to their passion of discovering smart solutions to complex problems. 3.Short and round nails – Very energetic and creative people with talents. Always radiating with positive attitude and joy making everyone around happy. They remain faithful to the people they love, doing everything to protect them. Further, these people have an adventurous spirit and when something is imagined nothing will stop them to fulfill that. Some may say that they are stubborn, but they actually know what they do. 4.Uneven and short nails – These people always bite their nails which is why they are uneven and it is probably due to them being sensitive and insightful people. Existing friendships are always being cultivated and they carefully think about new friends. When upset, they do not show their emotions staying calm from the outside besides the storm in the inside. Nothing but the truth comes out from their mouths even though it may sometimes be bitter. 5.Large and rectangular nails – These people are very valuable and born leaders approaching the work with great responsibility; also, they are entrusted with important meetings because other people know they won’t let them down. Everything is done properly due to them being hard-working and persistent. Moreover, they are positive people that love good company. 6.Triangular nails – Determined and brave people who know what they want accepting passionately every single task. They always think before they work and the hard work always looks excellent at the end. 7.Oval and long nails – These are creative people with a good imagination who are lucky if surrounded by beautiful things. Other people defer to them when experiencing an ocean of emotions so to find a port in their quiet harbor. When benefiting others, these people are more than happy to work always finding some innovative solutions. They know how to be happy and never get bored no matter what they do. You have to bear in mind that each person is unique and original in their own way and this only a sweet attempt for classification.